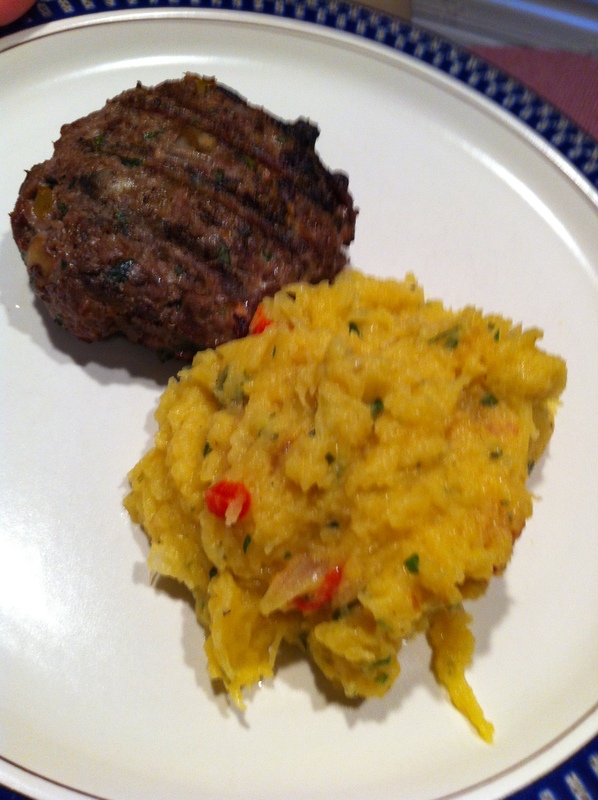 The plan for dinner tonight: grilled mini meat loafs and spaghetti squash (told you I love it – we probably have it at least once a week now). I left out the breadcrumbs/panko since we are working on the whole slow-carb eating. Of course, you could mix in whatever veggies you like, probably even some squash or carrots to help add a little flavor. I made 3 fat patties with all the ingredients and then Tony grilled them until cooked through. They were just a touch dry (probably due to the lean-ness), so I topped them with a little leftover marinara sauce we had in the fridge. The spaghetti squash… well… another little mishap happened. I was trying to see what it took to make it a little less crisp, so I roasted it in the oven a little longer. I had a fairly large-sized squash, so I thought the extra cooking time would be needed. I cut it in half, drizzled with olive oil and then baked it (cut side down) on a foiled pan on 400 degrees for 1.5 hours. It smelled good, looked good…. and was definitely soft. I used a sauté pan to sauté a few more onions and then added the squash (pulled out of the “shell” with a fork). It wasn’t quite in its normal stringy-ness… then I added a dash of white wine, salt and pepper and some roasted red pepper (approx. 1/4 cup). It was mushy. I had some of the Italian Herb and Cheese Reduced Fat Cooking Creme (leftover from homemade pizza) that I added (approx. 1/4 cup). It ended up being more the consistency of and a decent substitution for mashed potatoes… an even more appropriate side for meat loaf. I’d eat it again, but I think I prefer the more traditional “crisp” spaghetti squash recipes.